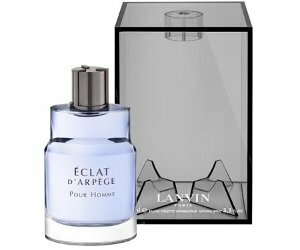 Lanvin has launched Éclat d'Arpège Pour Homme, a flanker to 2005's Arpège Pour Homme and the masculine counterpart to 2002's Eclat d'Arpège. The notes feature citrus, bergamot, lemon, mandarin, violet leaves, rosemary, jasmine, cedar, ambrofix, sandalwood and musk. Lanvin Éclat d'Arpège Pour Homme is available in 30, 50 and 100 ml Eau de Toilette. Update: Éclat d'Arpège Pour Homme was developed by perfumer Sonia Constant. At least their couture isn’t as sad, from what I hear. Yes — I hope it’s better than the perfume line. I quite liked Arpège Pour Homme, enough to buy a small bottle, though predictably I don’t wear it much. I did think it was strange that they would launch a men’s version almost eighty years after the original — and now this, thirteen years after the women’s version — but at least you can’t accuse them of rushing into anything. I have to disagree, ApH was quite nice. Unusually powdery-vanillic at the time it came out. As I wrote, the new Valentino Uomo reminds me A LOT of it, although ApH was more complex and less linear. The indistinct drydown may not have held the promise the sparkling opening made, but it was much better than the majority of men’s fragrance releases and much better quality. The original is now discontinued. What’s the point in naming sth. like a flanker to sth. that has been discontinued?! I guess since the women’s is still in production, they figure the name still has some life in it?